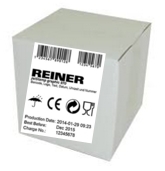 The Reiner JetStamp 970 Graphic Number Stamp is a mobile inkjet printer that makes Package Marking and Products Marking a breeze. Easily imprint Numbering, Time and Date, Barcodes and logos or graphics. Fixed Head Imprinting. The model JetStamp 970 features your choice of (1) Standard Ink or (1) MP Quick-Dry (MP=Metal / Plastic) Permanent Ink Cartridge with the starter kit. Purchase the alternate ink cartridge type and be prepared for any imprinting job. A Mobile Electronic Number Stamp for Product Marking or Parts Marking applications. 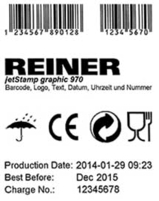 All you need for precise, Number, Time, Date or graphic printing...powerful Handheld InkJet printing with Reiner's JetStamp 970 Numering stamp. Simply place the unit's head onto surface, then "Press" the Red Button, to activate printing. A total of (4) Imprint Layouts can be stored and recalled in the unit. Print on any absorbent surface, with the use of the standard ink cartridge. Print on any NON-absorbent surface, with the use of the MP Quick-Dry ink cartridge. Rechargeable Battery provides up to 1, 000 prints. Easily create and store commonly used imprints, on the included configuration software. Then choose (4) to download to the JetStamp 970. Complete JetStamp 970 Number Stamp Kit includes; (1) JetStamp 970 Mobile Stamp (1) Configuration Software on CD, (1) USB Charger, (1) Black Ink Jet Cartridge (your choice of standard or quick-dry cartridge), (4) AA Rechargeable Batteries, (1) USB Data Transfer Cable, (1) User Manual. Applications: A Totally mobile Solution for Time Date Numbering, Barcodes and Graphics...uses such as; Parts Marking, Package Marking and validating in surgeries, pharmacies, and hospitals, marking dockets and packages in transit, quality control validation, laboratory timing and checking, production controls, delicate product marking, nightclub and meetings entry validation, etc. Watch this video to see the JetStamp 970 Graphic Handheld Number and Date Stamp in action.